A Santiago Calatrava transport building is in the news again, as usual not entirely for the right reasons. The Spanish architect’s latest station, the World Trade Center Transportation Hub, has begun a phased opening programme, giving passengers their first glimpse inside the building. It’s running late and at about double the original budget, and has gone through some late design changes (or compromises, depending on your point of view) along the way, as detailed rather brilliantly by the New York Times, which suggests that the latter, as so often, has caused the former. It has been characterised by one columnist in the New York Post as (splendid American term) a “boondoggle”. Alongside the cost rises and completion delays, the World Trade Center Transportation Hub has also been criticised for going rusty before it’s even been completed (as you can see on this webpage at the New York Observer), but that might just be because the structural elements haven’t had their final finishes applied. I must admit that I’ve seldom come across an architect whose buildings have proved quite so controversial, even after completion, as Calatrava. But then I suppose that’s what you get when you employ someone who is just as much an artist as an architect, and whose buildings are just as much sculpture, and very often just as much skeletal remains of fantastical beasts, as they are conventional structures. His work is at once highly distinctive, unlikely to be confused with that of any other architect, and yet extremely diverse. You can recognise elements in some of his buildings that remind you of others he has designed, but unlike some architects, you won’t find repetition of the same basic building with minor modifications to suit different sites. Previously on the beauty of transport, we’ve looked at his railway stations Gare de Lyon Saint-Exupéry and Gare Liège-Guillemins. This time we’re going to Lisbon for his 1998 Estação do Oriente. Then he got started on the station itself, which is where things get really spectacular. Thank goodness the new station was built in the Expo district, itself full of striking modern architecture. 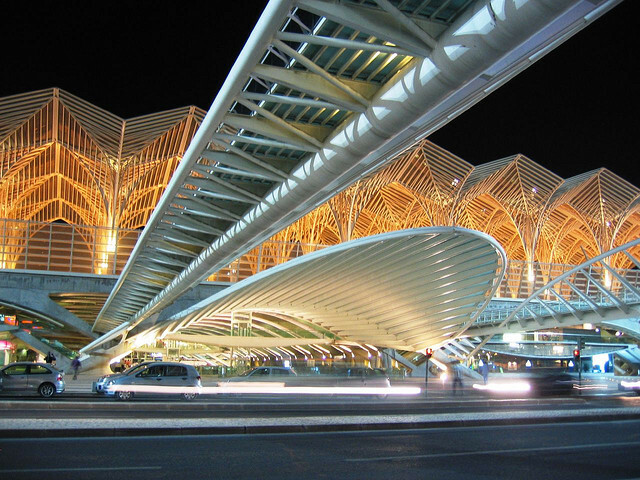 Let’s face it, a large Calatrava station tends to materialise like the ossified remains of something large and vicious from Game of Thrones, and it would have proven even more disconcerting had it done so in Lisbon’s historic city centre. At ground level, the main entrance to the station is on the east side, under a large cantilevered canopy (which you can see in the photo above) that might remind you of Calatrava’s Liège-Guillemins station, but also references the curved canopies of Guimard’s Paris Métro Art Nouveau station entrances, except at a vastly increased scale. Overhead, a pair of footbridges link the next storey of the station with the Vasco da Gama shopping mall across the road. The main entrance and the footbridges all lead into the belly of the beast, the below-platform part of Estação do Oriente, which has replaced what used to be the railway embankment. It’s like something from a science fiction film set in there, a complicated construction of twinned arches, ribs, columns and braces (I think). There’s something of Gaudí about it, and something of Geiger, too. It’s a stark, undecorated, disturbing and beautiful piece of work that blurs the boundaries between engineering, sculpture and architecture. It houses ticket offices, shops, services and refreshment facilities – all the things you’d expect a major station to house. And Estação do Oriente is a major station, though it’s not precisely clear how major. Wikipedia says it has 75 million passengers per year, which makes it as busy as Grand Central Terminal in New York. This statistic is repeated endlessly around the web, though as far as I can tell copied from the Wikipedia entry in the first place, which cites no source. Personally, I’d be surprised if Estação do Oriente was as busy as Grand Central, but I’m willing to be proved wrong. There are secondary entrance/exits linking the lower part of the station to the roads which run underneath the railway at both ends of the station, through arches which, if not quite as dramatic as the structures inside the main part of station’s lower levels, are some of the more interesting road-under-railway bridges you’ll come across. These arches are used to give shelter to bus stops and car passenger drop-off points. Estação do Oriente is a proper public transport interchange, not just a railway station. 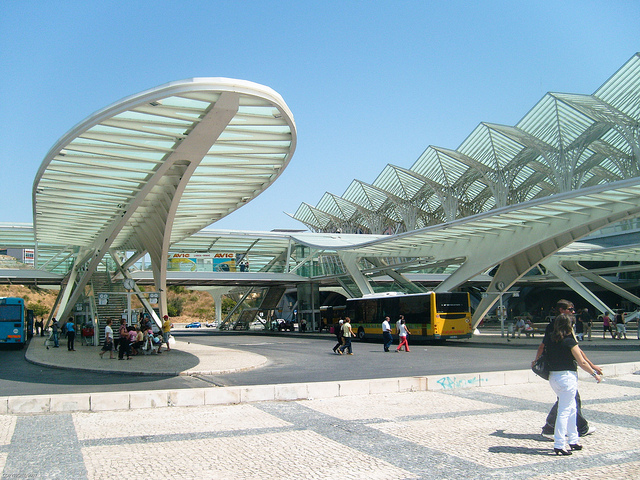 Escalators and stairs lead down to lower levels and a station on the red line of the Lisbon Metro, while immediately to the west is a large coach and bus station. 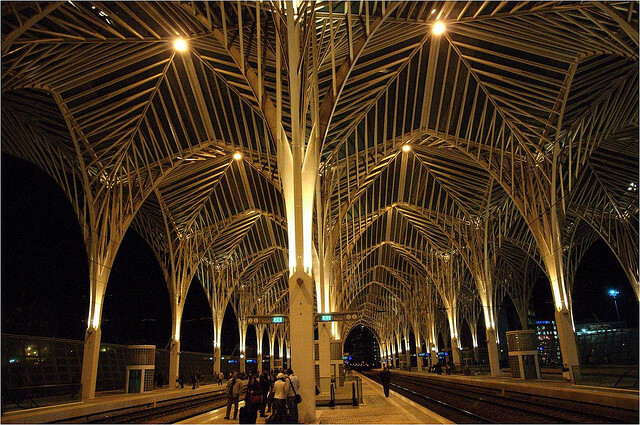 This was also designed by Calatrava as part of the overall station architecture. It is accessed by a single covered footbridge running out of the west side of the station at the same level as the twin footbridges enter on the east side, and it runs over the various bus/coach bays. It’s rare to see such a level of architectural input into a coach/bus station, and demonstrates that it’s only lack of vision, rather than anything innate, which has left many similar structures around the world so bereft of architectural merit. Long glazed canopies extend out from the staircases and glass lift shafts which lead down onto the bus/coach boarding islands. Vehicular access in and out of the bus/coach station is facilitated by the revised road layout designed by Calatrava. So that’s the lower levels of the station, below the height of the original embankment. I have, however, been saving what is arguably the most famous and most dramatic part of the station, until last. On the top level, the railway tracks and platforms are sheltered by one of the most dramatic modern railway station roofs you will ever see. Based on a 56ft grid, columns reach up to a glass roof, with braces forming gothic pointed arch shapes. Again, you can see echoes of Gaudí’s Sagrada Família if you want to, but really it’s Calatrava’s interpretation of the same thing Gaudí was interpreting, the tree trunks and canopy of a forest. It is an extraordinarily beautiful structure, much photographed, and understandably so. 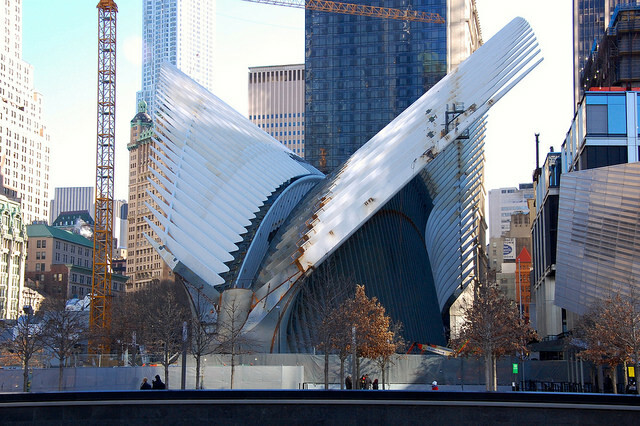 Calatrava has taken the concept of a landmark station roof from the Victorian era, but executed it with a modern twist. He’s captured the same spectacle and drama, but in an entirely new form. Given its complexity, I wouldn’t have been at all surprised to hear that Estação do Oriente opened late and over budget, though as far as I can tell it was neither. It certainly can’t have been cheap and construction must have been very disruptive. But as with all such landmarks, it’s already got to the point where nobody cares any more, and the station is admired for the practical work of art it is. Hopefully New York will get over its Calatrava boondoggle worries just as quickly. It really is a beautiful sight and (having visited Lisbon) am glad I took the time to wander round before heading to the sights of parque de nacoes. 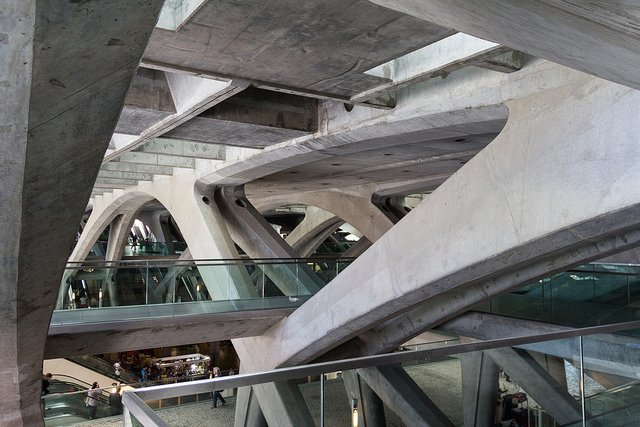 Great photos of gare do oriente!